Charting a course forward involves being an active part of the nation’s healing process, writes Jimmy LaSalvia. Many of you know that a recent Harris Poll showed a decrease of the acceptance of LGBT people in America over the past year. Many have rightly placed blame for this on a cultural and political climate, fueled by President Trump’s divisiveness, that rejects “political correctness” and societal norms of civility. I guess that’s just one more of the many ways LGBT people lose in the age of Trump. Of course, Trumpian culture didn’t just happen overnight. This culture of confrontation and fighting has been building for many years, and the Trump presidency is the culmination of a long devolution away from kindness and civility. Now, in all areas of American life, it’s become “us versus them,” a constant fight. Fortunately, more and more of us are growing tired of all the fighting. I know I am — aren’t you? A growing majority of us are ready to move on and chart a new unified path forward. 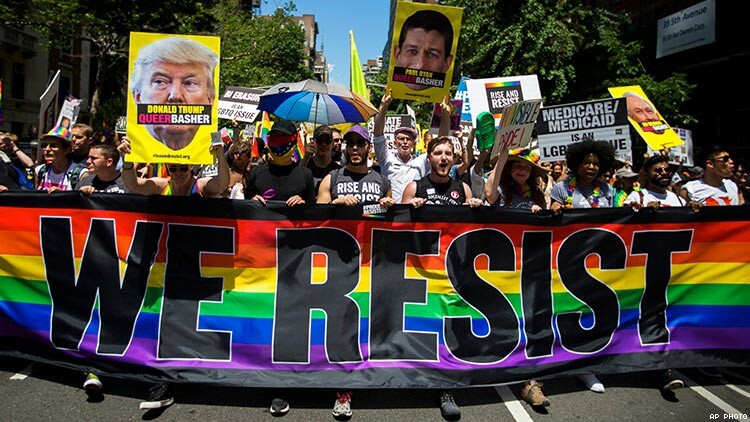 The LGBT community has an opportunity to lead the country in ushering a new culture of unity and helping each other in the coming post-Trump years. Now is the time to start thinking about it and preparing for a new style of activism after Trump. With a goal of bringing all Americans together to help each other to realize the American Dream, our community can gain legal equality and ultimately help to make our country better for everybody. You see, helping others to realize their American Dreams means that we don’t discriminate when we enter the public square to conduct commerce. It means that we are all paid the same for the same work. It means that those of us who have built our entire lives in this country have access to a pathway to citizenship. Those public policy issues that may have been seen as divisive in the past strike a different tone when presented in a context of unity. That tone will resonate in the time of national healing after Trump. LGBT activism in the coming years should convey that big, broad, message of American unity. That’s the way we’ll realize our political goals and help to bring about positive cultural change. Writer Andrew Sullivan recently caused quite a stir among LGBT activists with a controversial New York Magazine post. Some saw the article as ill-informed and his tone as caustic. While there is much to disagree with on some of his specific points and his finger-pointing delivery, his assertion that finding common ground is effective in achieving favorable political outcomes is absolutely correct. The fight for marriage equality, for instance, was won after many years of showing others how our love is the same as theirs. It was in that message of commonality that most Americans found unity around our desire to marry. This way of framing our activism may be uncomfortable for some of us at first, because so many of us have always felt different, like outsiders. We are used to having to explain our differences to others. We may have to rethink the way we see ourselves. Remember, there are no outsiders in a unified America. There will still be plenty of opportunities in our cultural experiences and events for discussions and celebrations of what makes us unique and different, but in the political arena, our message should be clear and undiluted. Our rainbow colors should shine as a white light of freedom and opportunity for everyone. I know that we have many battles to fight and likely three years to go before our country can begin the process of putting the Trump presidency and the culture that created it behind us, but it’s never too early to begin to lay the groundwork to be leaders when that time comes. And I also know that cultural change doesn’t happen overnight. A switch isn’t going to flip when the Trumps leave the White House, but it is important for us to have a clear vision of what the future can look like if we work to make it that way. My vision for a unified post-Trump America is something that I am committed to working toward. I hope that all LGBT Americans will recognize the opportunity that the future holds for us and join in the effort to bring about a new culture of civility and helping each other. The next era of LGBT activism can help to make America a country where unity wins. JIMMY LASALVIA is a politically independent strategist and commentator. He is the author of No Hope: Why I Left the GOP (and You Should Too). Originally published at www.advocate.com on January 30, 2018.